Quiet 3 bedroom modern, situated at the end of a Cul del Sac, Open Plan kitchen, dining, lounge, and conservatory, beautiful sea views from the living area 2 of the bedrooms and deck, relax with all the comforts of home including Sky TV and wireless internet and enjoy the peaceful surroundings and seaviews. Off street parking available. 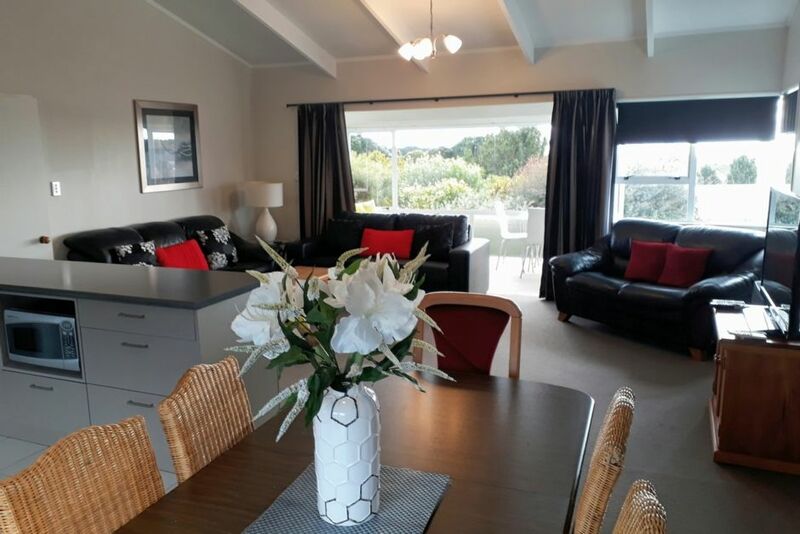 Close to cafe's, and the very popular coastal walkway, beaches, Pukekura Park, Bowl of Brooklands, golf courses, bowling greens, shopping centres and the new cycling velodrome and cycle park. We provide everything, apart from food, for up to 8 people is great accommodation for those wanting to stay in New Plymouth only 10 minutes from city centre. NB: In addition there is a studio apartment above the garage only, with it's own separate entrance ,this is the owners holiday flat. Also, there is a sleepout at the rear of the property, which is currently tenanted with a quiet working tenant. They share the laundry facilities in the garage. Smoking allowed outside only. No parties please. Safe for families, ideal holiday home, fully fenced with off street parking. Heat Pump is for heating and air conditioning. All Linen is provided at no cost. Washing Machine & Dryer & soap powder available. Off Street Parking for 2 or 3 cars. All linen provided at no cost. Full under bench oven and electric hobbs..
Dinnerset, cutlery, pots & pans and utensils available. Kitchen and dining room as per photos. Carol’s place is a great place for a family to stay having everything required right there. She has thought of everything. We will definitely stay again the next time we visit. Carol is also a very kind host, she was very helpful when our family wasn’t well. Excellent Guests,extremely tidy would highly recommend to future property owners. Big spacious property for price. Good layout and well equipped. Nice sea views from garden. Easy 10min drive into centre of New Plymouth. House was a bit dusty and hadn't appreciated we would be required to do a basic clean before we left. Also didn't like the fact there is another small house behind which means people walking along the back of the house when occupied. Fabulous place to stay, everything you need, very clean and tidy, nice decor. Warm house, extra bedding and blankets, plenty of linen provided. Nice quiet location but not too far from CBD.